After the mixed weather on Saturday, Vienna CC were able to open their Open League campaign in sunshine on Sunday, against Lords CC, who were playing their first league game of their silver jubilee year. Andrew Simpson-Parker returned to the starting eleven, while Revantha Ramanayake made his début for VCC. Winning the toss and batting first, Vienna CC started slowly, but solidly, with Tim Simpson and Andrew Simpson-Parker putting on 26 for the first wicket. After Andrew’s departure, bowled for 9, and Daniel Ali departing for a duck, Tim fell 25, bowled by Sahil, whose spell of 8 overs for 19 runs, with 2 wickets was the pick of the Lords CC bowling. Skipper Quinton was joined by Mark Simpson-Parker in the 14th over, and Mark would only finally fall, 6 short of a fifty in the final over, about 1 3/4 hours later. Mark was supports by Yoshan, who hung around for 10 overs for 7, and by Revantha, making 14 on début whose innings was ended by a sharp catch in the gully by Rajeev, and Neil. Vienna CC finished on 158-8 in 40 overs, adding 91 in the last 20 overs. Extras (28) were second highest scorer. After a catch at the start of the 4th over, taken by Neil Foster-McGregor off the bowling of Mark Simpson-Parker, it looked very much one way traffic until the 20 over drinks interval – catches were dropped and Lords CC motored to 111-1 with Satish Kaul passing 50. With the scorer baling in disgust to take photos instead (as 12th man Owen had arrived and had decided to make enough noises to indicate that he wanted to score), both established batsmen fell straight after drinks – with Satish making 60 and Maninder Bharti making a patient 32, and suddening Lords were 113-3. Sahil Bharti and Nandeep Soggi advanced the score to 139, before a purple patch of 4 wickets for 2 runs – both Neil and Mark Simpson-Parker being on hattricks. Unfortunately Mark struggled somewhat with no balls and wides, while Neil remained consistent, and taking his third wicket with 7 needed to win, finished with figures of 8-0-26-3, while Mark went for 48 off his six overs, taking three wickets. Sukhvir and Rajeev took Lords CC home to a 2 wicket victory, consigning Vienna CC to another league defeat. A few catches held earlier and 158 could have been defended. 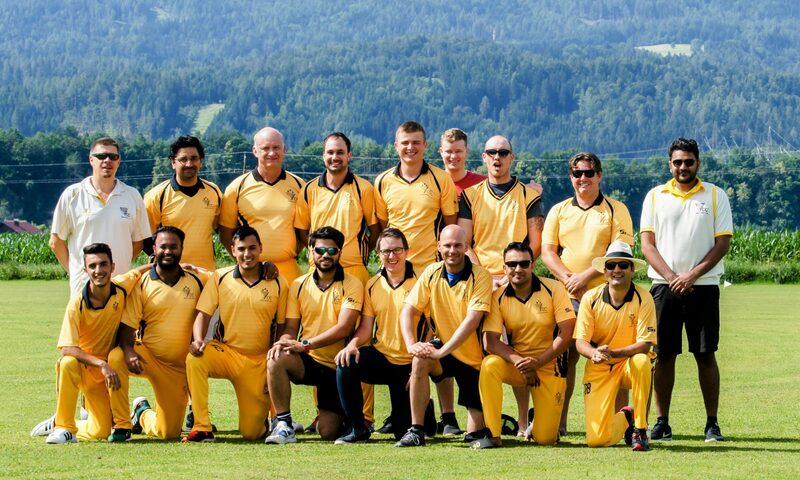 Hopefully the club’s squad will also use the friendly fixtures against Phoenix CC (Budapest) and the touring team from Nijmegen (Netherlands) to get time out in the middle and to take some catches.